S&K picked out this summery outfit - Yellow Mini Tank and Ana Skirt, both by Pink Chicken NY, while shopping in Petit Ami boutique on March 4th. S&K spotted out in LA on Thursday, 18. Suri is wearing Reni Pink Zebra Print Dress by Esme LoungeWear. *Suri is wearing the long-sleeved version with pink lace trim, unfortunately i only found a stock picture of the short-sleeve version with a white lace trim. well i guess if Victoria Beckham can wear sweatpants to the movies, than Suri Cruise can wear nightgown to a dance class... blah. Suri & Katie pick up some sweet treats at Le Pain Quotidien after a dance class, in Santa Monica Blvd. on Wednesday, 12th. Suri is wearing a Striped Rugby Dress by Splendid Littles. "Katie is not pregnant", her rep tells PEOPLE. 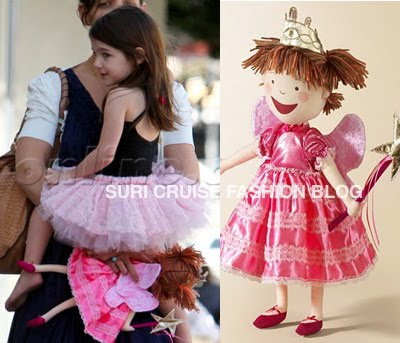 Suri held onto her new Madame Alexander Pinkalicious Doll available at SAKS for $45. 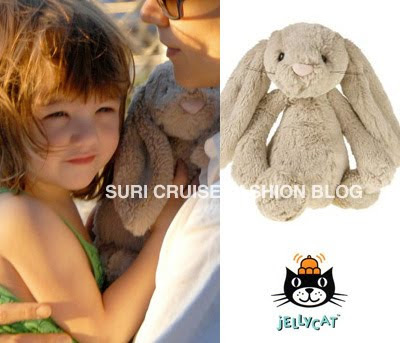 Suri snuggled her Plush Bashful Bunny by Jellycat now available at GAP for only $16. Suri goes for a dance class at Village Arts Dance Studio in Pacific Palisades, CA on Thursday, 4.
after leaving the dance studio, girls went shopping to Petit Ami Boutique in Beverly Hills. 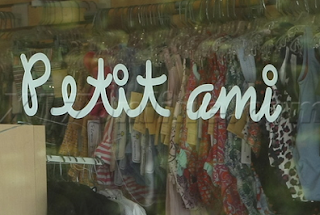 S&K purchased a yellow top and green flower print skirt from the Boutique (pictured above).